The IAM stepped up to the ‘Humanitarian Plate’ this week with a $50,000 donation to Canada’s Haiti Earthquake Relief Fund (CERF). For every dollar donated to the CERF, the government of Canada will donate an equal amount, bringing the combined donation to $100,000. “Whether it’s the December 26, 2004 tsunami that hit Indonesia, or Hurricane Katrina which devastated New Orleans, members of the Machinists have always donated generously in times of hardship,” said Ritchie. IAM members in the U.S. wishing to maximize their charitable giving can donate through Union Plus, which is matching all contributions made through the AFL-CIO’s Solidarity Center. 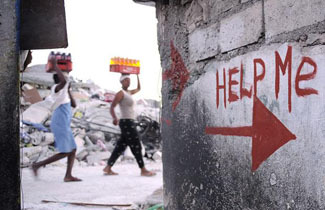 Visit http://www.unionplus.org/haiti-earthquake-relief for more information.